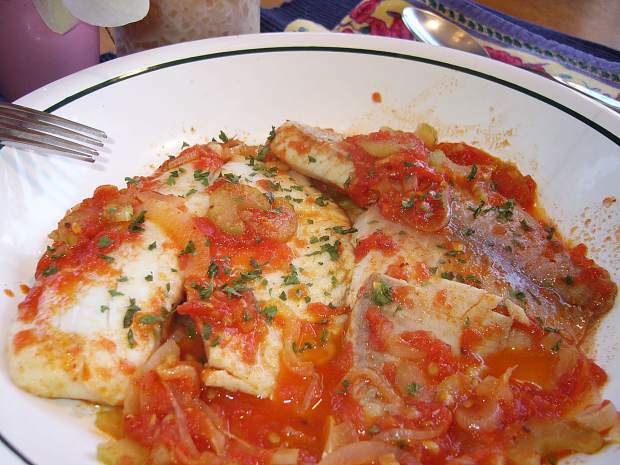 Mediterranean fish with tomato and cumin is a foolproof way to prepare a moist and delicious meal. The internet has changed our lives in so many ways. One way it has had a profound impact is in the way we cook. Some people feel that cookbooks are now obsolete. The ability to search for recipes by name, key ingredient or characteristic such as “fast and easy,” is a huge advantage. On the other hand, a physical book has its advantages as well. While an internet search can turn up an impressive array of recipe choices, locating a specific one that you previously enjoyed can sometimes be difficult. This is where cookbooks have an advantage. Our senses are powerful memory triggers. This is why comfort food has the effect that it does. A particular taste, or smell, triggers fond memories that bring, well, comfort. In some cases memories can be triggered by a general association. Ice cream, for example, can bring a smile with the mere mention of its name. In other cases, we are more selective, requiring a particular flavor or smell to take us to that happy place. I can always rely on the fact that a recipe I wish to repeat will be found on the same page in the same book on my shelf. Furthermore, any notes I have made about adjusting the recipe will be waiting for me there, too. Seeing those dog-eared and food-splattered pages triggers an anticipation of how much I’m going to enjoy this dish again. Cookbooks generally follow a philosophy. This makes assembling a menu of dishes that are truly compatible an easy task. When Kathy came home all aglow with her latest tome, I confess that I rolled my eyes. Here was a book over 2 inches thick and 400 pages long. “Will I ever really cook a significant portion of these recipes?” I asked myself. Nonetheless, “The Cooking of the Eastern Mediterranean” by Paula Wolfert has earned a permanent place on our shelf. Among the many recipes, one fish recipe in particular has become a staple for us. This Turkish-style dish is fast, easy and needs only one pan. Below is my adaptation from the original. A key flavor that is a trigger for me is Aleppo pepper. The Middle East is renowned for its spice bazaars where literally dozens of different ground peppers can be found. Aleppo pepper is course, gritty, dark red, earthy and robust. The flavor is haunting. You may also see it sold under the name “Near East Pepper.” A suitable substitute can be made using three parts sweet Hungarian paprika and one part mildly hot crushed red pepper flakes. Poaching fish is a foolproof method to make sure it comes out moist. In this dish, fresh tomato is grated to form a poaching liquid. Celery and onion give the sauce body and texture. The recipe works best with mild, white-fleshed fish. I have used sole with outstanding results, though it is only seasonally available. Readily available and very affordable, tilapia has become the fish I rely on when preparing this dish. You can watch a demonstration on YouTube here: http://www.youtu.be/K6lv75GxhVg. I have come to find that both the internet and my treasured collection of cookbooks each offer benefits when it comes to feeding my wife and me day after day. When it comes to food that triggers fond memories and warm feelings, cookbooks take the cake every time. 1.) Rinse the fish and pat dry with paper towels. Sprinkle with salt and set aside. 2.) Heat a large skillet over medium heat and add the oil, onion, celery and garlic. Cover and let steam 2-3 minutes. Add the cumin and red pepper and cook, stirring, another minute. Add the tomato and 1/2 cup water and bring to a boil. Add salt and black pepper to taste. 3.) Lay each fillet in the simmering sauce, cover and cook over medium-low heat 5-8 minutes, or just until the fish is opaque and cooked through. Carefully remove the fillets and place in a serving dish. Boil the pan juices to reduce to a thicker consistency. Pour the sauce over the fish and serve when you are ready. Garnish with fresh chopped parsley if desired. Tom Castrigno lives in Frisco, Colorado, where he is known as The Mobile Chef. Visitors to Summit County can enjoy one of Tom’s delicious meals prepared right in their condo. Learn More at http://www.BreckenridgePrivateChef.com.